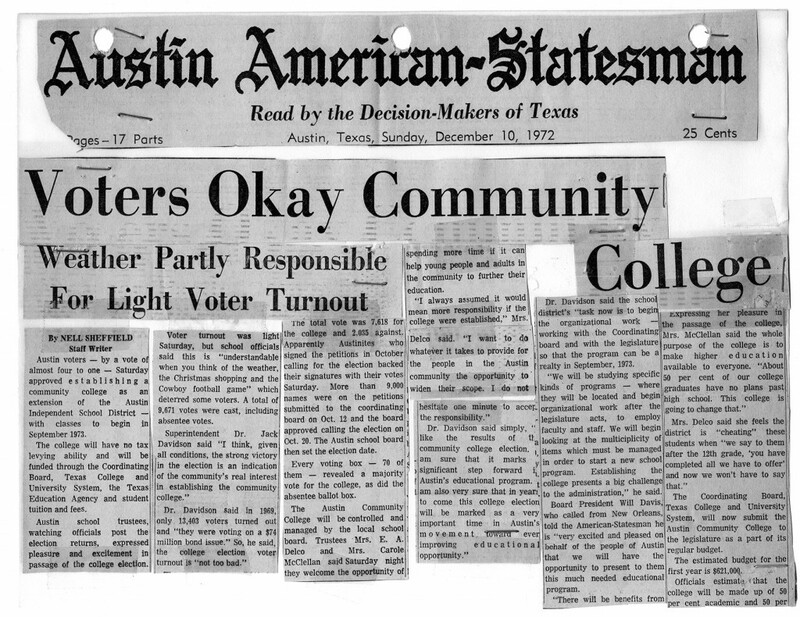 On Saturday, December 9, 1972, Austin voters said “Yes” to a new community college. Whether Austin needed or could afford a community college had been debated for years. Three times, in 1963, 1965, and 1968, voters had scuttled plans for a tax-supported college. But this time the results were different, and for two big reasons. 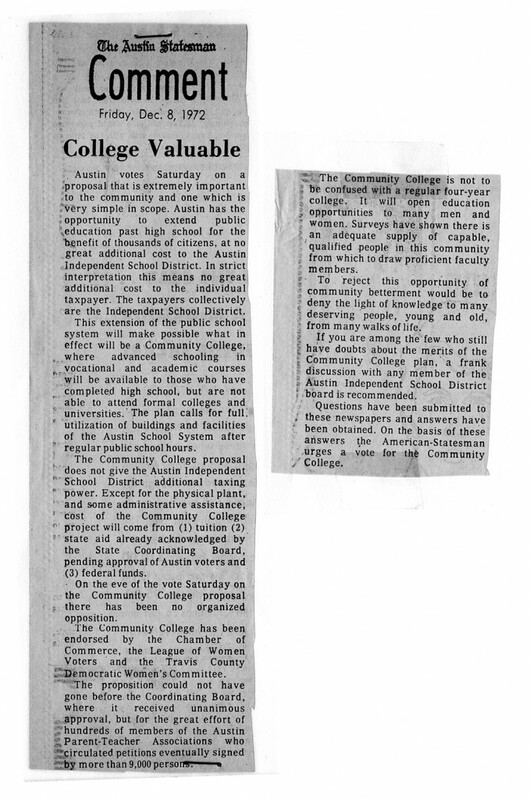 The question presented to voters on December 9, 1972, was whether the Austin Independent School District should operate an open-admissions “community college,” utilizing existing facilities for freshman and sophomore level academic courses, vocational/technical programs, Adult Basic Education, and continuing education classes. First, the weather was bad on election-day, and many Austinites had other things beside voting on their minds: Christmas shopping, for one, and a Dallas Cowboys football game. Second, there would be no taxes involved. 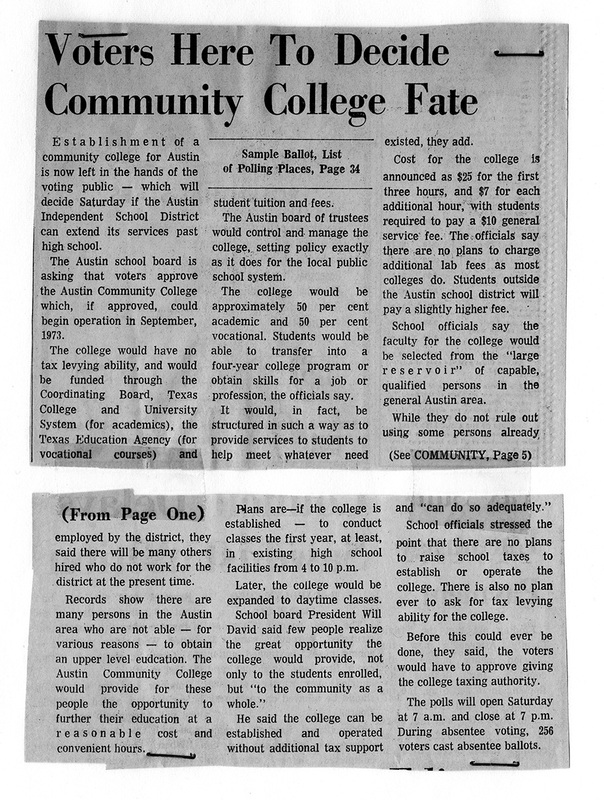 The Austin American-Statesman newspaper had covered three earlier efforts to create a tax-supported junior/community college in Austin, all of which had failed, and now the newspaper’s editorial board endorsed the creation of a community college as an adjunct to AISD. Backers of Austin Community College took advantage of an obscure law that allowed the Austin Independent School District (AISD) to operate a community college. Funding would come mostly from the state, through the Texas College System Coordinating Board and the Texas Education Agency (TEA), and from student tuition and fees. Fortune smiled on Austin Community College on Election Day, as bad weather and a Dallas Cowboys football game on television meant a light turnout and perhaps kept more opponents at home and away from the polls than supporters.